Jodo is the way of the staff. Originally called Jojutsu, the name change to Jodo in 1940. 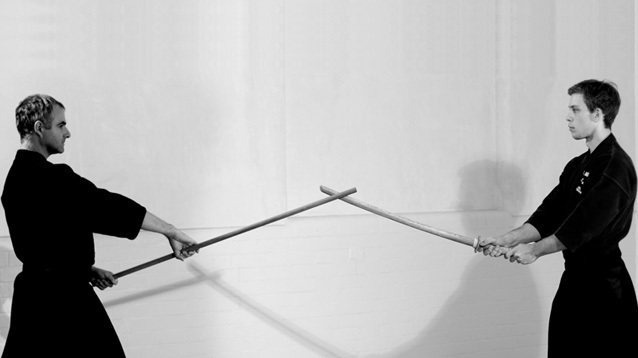 This way of using the staff was devised by one master swordsman in the early 1600s. Gonnosuke Katsukichi was a swordsman who held a teaching licence in Tenshin Shoden Katori Shinto Ryu. 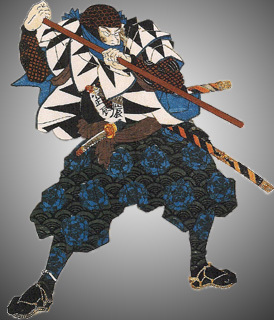 Gonnosuke, like others of his time, developed his skills by engaging in many duels around the country. To the outsider it appears that the purpose of the art is for the stick to beat the sword; nothing could be further from the truth. 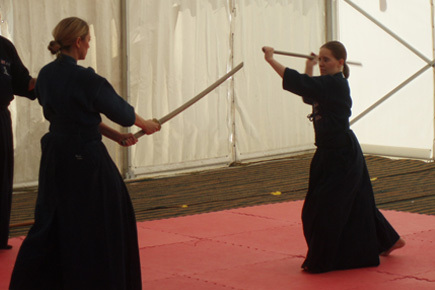 Someone who starts training in the art of Jodo quickly finds that development of sword skills are just as important as competence with the jo. 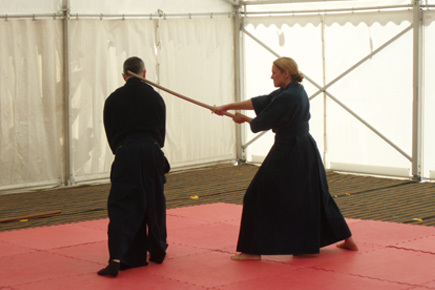 To this end, the development of people doing Jodo comes about through the mutual challenge of the Uchidachi (swordsman) against the Shijo (staff wielding person). This interrelation between the two provides mutual progression in physical health, mental versatility and emotional strength. 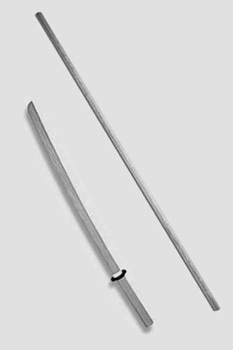 The role of Uchidachi is usually taken up by the senior of the pair i.e. the teacher with the Shijo role being filled by the student. 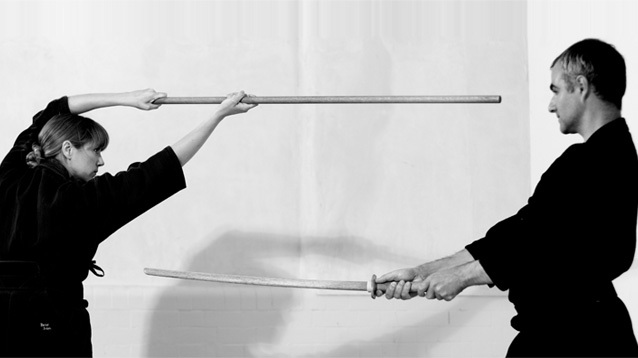 The Uchidachi attacks and provokes the Shijo who must respond in such a way to defeat the Uchidachi without allowing danger to themselves. The Shijo must try their hardest to beat the Uchidachi, the Uchidachi must test and push the Shijo. Both sides develop skill, control and restraint. 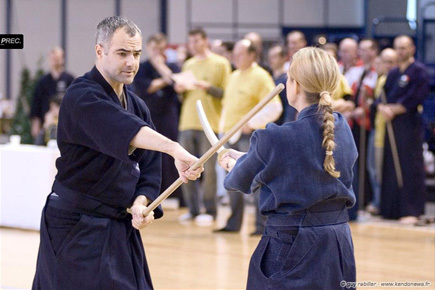 Because Jodo originated out of the conglomeration of several weapons styles the curriculum is quite broad both in technical diversity as well as number of forms. 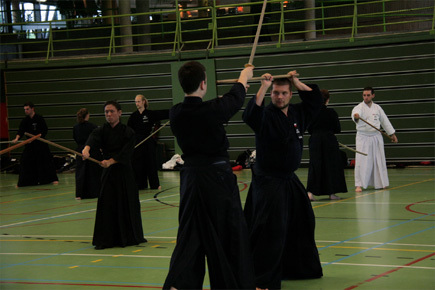 Techniques taken from the sword, the spear, the staff and the halberd are combined into Jodo to create movements of striking, thrusting, catching, trapping, throwing, blocking, sweeping, locking and subduing. 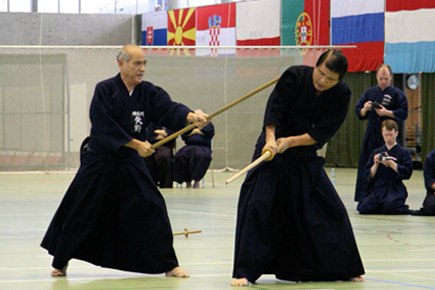 Furthermore, the role of the Uchidachi is one of learning and improving their kenpo (sword methodology) and as such they learn the techniques of cutting (from a variety of positions and angles), thrusting and blocking. 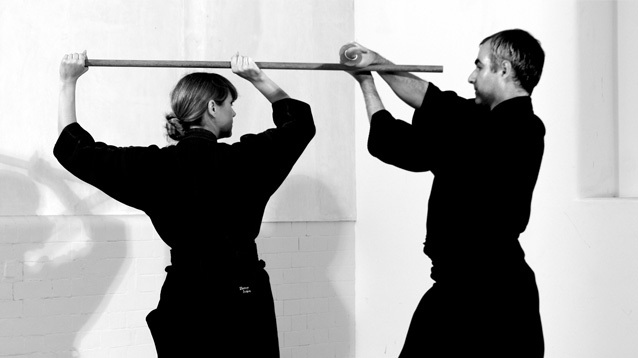 Jodo at a practical level teaches versatility and flexibility with the various weapons within the curriculum. 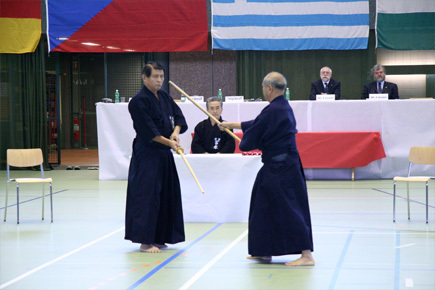 12 representative forms were taken from the Shindo Muso Ryu to form The All Japan Kendo Federations standard Jodo forms called Seitei Kata. 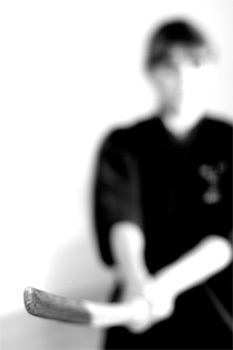 Koryu are older techniques from which the 12 Seitei Kata were chosen. 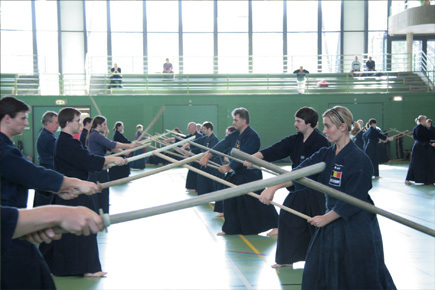 The koryu schools are Omote, Chudan, Kage, Samidare, Gohon No Midare, and Okuden And also various other weapons which include The use of the short stick (Uchida Ryu Tanjo Jutsu), the metal truncheon (Ikkaku Ryu Jitte Jutsu), the sword (Shinto Ryu Kenjutsu) sickle and chain (Isshin Ryu Kusarigama Jutsu) and rope tying (Ittatsu Ryu Hojo Jutsu), although some of these Ryuha (schools) are rarely seen outside of Japan. 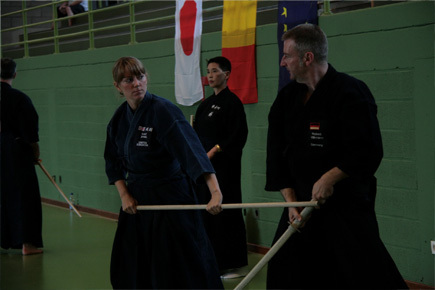 There are currently 29 dojos within the BKA that teach Jodo. You can find them by clicking on each item of the list on the side. You can always contact us at one of our email addresses: info@learnjodo.org.uk or info@bkajodo.org. Newsletters are available as PDF files on the right menu. 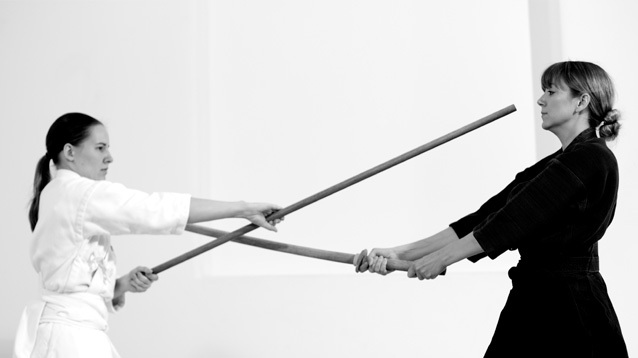 They explain who we are, what we do, and what happens in our Jodo world. 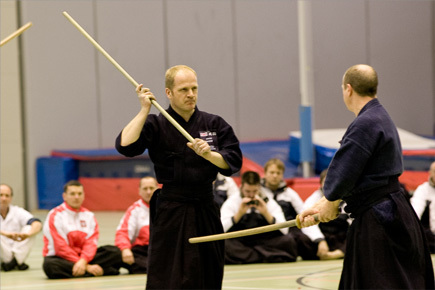 Jodo is a traditional Japanese martial art using a short staff or stick against a person armed with a wooden sword. The art traces a history back to the age of the samurai when warriors were expected to learn a multitude of weapons-based martial arts including the katana (sword), yari (spear), naginata (glaive) and bo (staff). 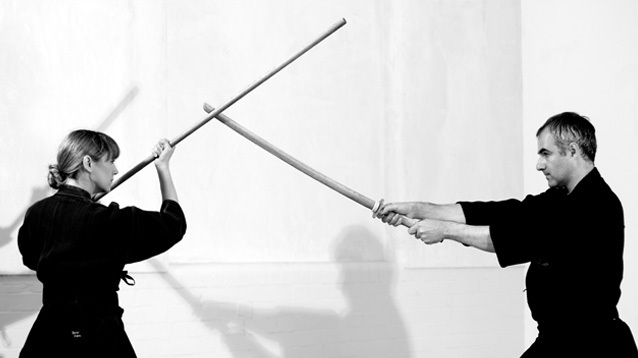 The art of Jodo uses techniques from all of the aforementioned weapons systems to create a versatile weapon that can be used in a multitude of ways. Nowadays the art is practised with a stronger focus on developing the body and the mind without forgetting the practicality of this weapons methods and style.